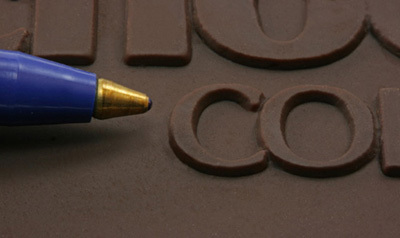 This dark chocolate shows the sharp relief produced with our high cocoa product. The best relief visibility is provided by our milk chocolate. Milk chocolate provides a nice visual contrast and sharp relief. Notice the fine detail including dots, lines and raised areas. The level of detail enables more complex designs for your chocolate and gives you more freedom to create your dream chocolate. 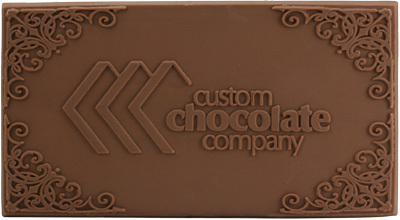 This is also ideal for accurately rendering corporate logos in chocolate as part of your design. 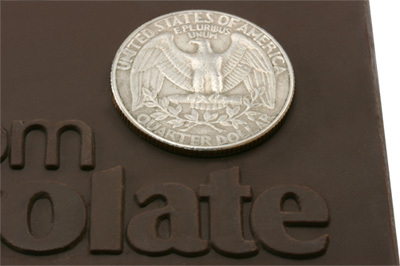 A quarter is provided for relative size on this highly enlarged portion of a custom dark chocolate. Note the clear edge detail. This unique perspective provides a good view of the depth and quality of lettering and logo rendering detail. 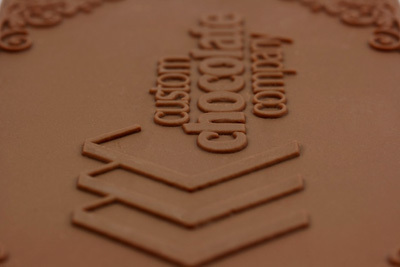 When you provide your image for a custom order we provide a proof and indicate if any design elements need modification to display well in chocolate. Note: While we endeavor to make each custom chocolate perfect, all are custom made and there may be some small flaws or variations between chocolates.